A visit to Stutthof Museum is recommended for anyone who wishes to learn more about the 20th century history of Gdansk, the growth of Fascism in the area and the effects this had on the local population. 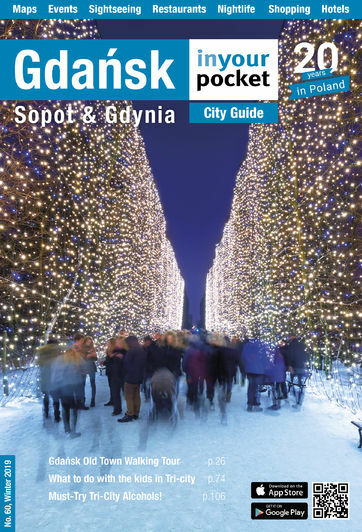 The town of Sztutowo lies 55 kilometres east of Gdańsk and is easily accessed by both car and bus. Journey time by bus is about 80 minutes and costs 14zl. From Gdansk bus station board the bus headed to Krynica Morska, then jump off once you pass the perimeter of the camp on your left hand side. Take road number 7 before turning left just after crossing the Wisła (in the direction of Mikoszewo). Once in Mikoszewo follow signs to Krynica Morska. You’ll find Sztutowo on the way. Total distance - 55km. A visit to Stutthof Museum is recommended for anyone who wishes to learn more about the 20th century history of Gdansk, the growth of Facism in the area and the effects this had on the local population (note it is advised that children under 13 should not visit). 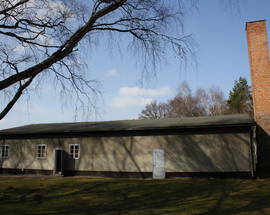 While the crowds of visitors to the most infamous of death camps at Auschwitz are hit by the overwhelming scale of the murder and cruelty carried out by the Nazis, the peaceful, tidily kept camp of Stutthof set among the trees and just a couple of kilometres from the beach, has a different atmosphere but an equally lasting effect. 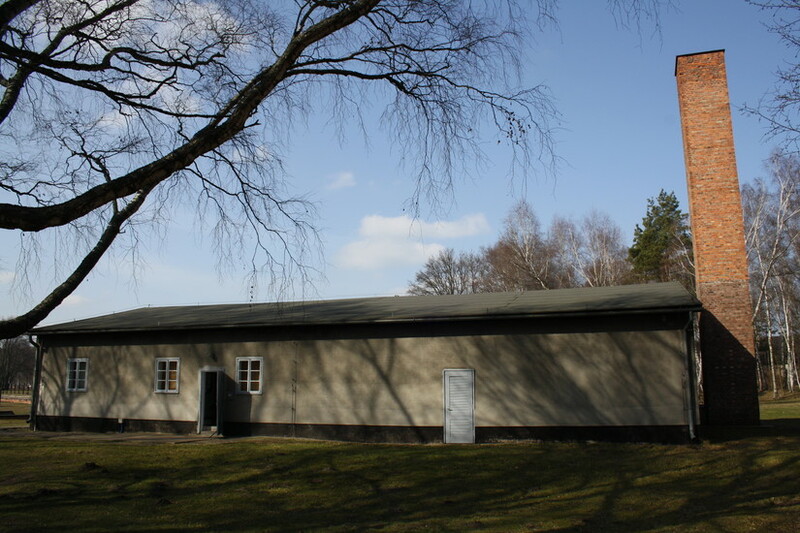 Covering around 20% of the former camp area, Stutthof Museum has undergone a significant program of modernisation. 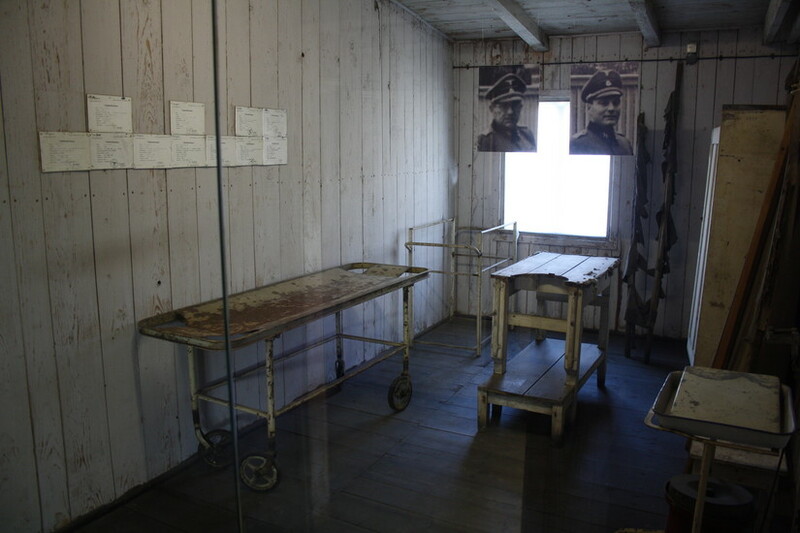 The museum is easy to walk around and while not everything comes with English language descriptions, there are enough boards and explanations dotted around the site to allow you to understand how Stutthof concentration camp came about and what happened here. 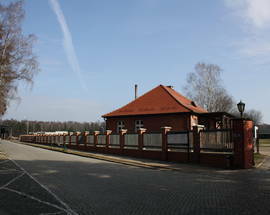 You will enter the area of the museum by crossing over the narrow gauge railway line that runs around the camp. To your right where you’ll see first the villa where the camp commandant and his family lived and then a smaller building which was home to the camp’s guard dogs. You’ll see one of the many boards outside which describe points of interest in three languages - Polish, German and English. This particular board points out that the purebred German Shepherds housed here weighed more than some of the starving inmates they were trained to guard. Your first point of call on arrival at the main gate to the camp should be to the information point and shop to the left as you enter the gate. Housed in the former SS Guardhouse, the friendly people here can furnish you with guidebooks in a number of languages as well as hook you up with tour guides. In the years after the war Stutthof was allowed to fall into disrepair, many of its buildings falling prey to both the elements and looters. The Kommandatur building at the front, which you’ll next see on your right, was once the administrative heart of the concentration camp. Following the end of the war, the building existed for over a decade as a tourist hotel, while the former DAW Armaments Factory passed into state hands. The decision to turn Stutthof into a museum was only reached in 1961, and what you see today is the result of years of research and restoration. Before you enter the camp proper you should take a few minutes to watch the sobering films detailing everyday life in the camp which are shown in the Kommandatur. Screenings are shown every half hour during the season (from 09:30 - 16:30 until the end of September); although in off-season these take place whenever there is a minimum of four people waiting to see it. The film acts as a fitting prelude to what you are about to see. It’s also here, in corridors that once resounded to the thump of jackboots, you’ll find temporary exhibitions of inmate art as well as the archive and book of remembrance (which is on display variously depending on exhibits). Having left the admin building the scale of atrocities hits home on entering the first proper exhibit housed in what was once the Political Department: thousands of shoes confiscated from prisoners lie piled up in dusty stacks. Next door in this single storey hut which was home to the Gestapo are a series of shrines to the Polish priests who were among the first rounded-up and executed following the Nazi takeover of Danzig. It’s after this visitors pass through what was once referred to as ‘the death gate’ - the main entrance through which tens of thousands entered the camp. Directly to the right a barracks tells the wartime history of both the camp and the regime. The outbreak of the war is covered in specific detail, with accompanying photos and mugshots of the first arrests and Nazi murders, while further on other sections deal with the camps construction and the SS crews employed within; Himmler’s visit is given particular attention. 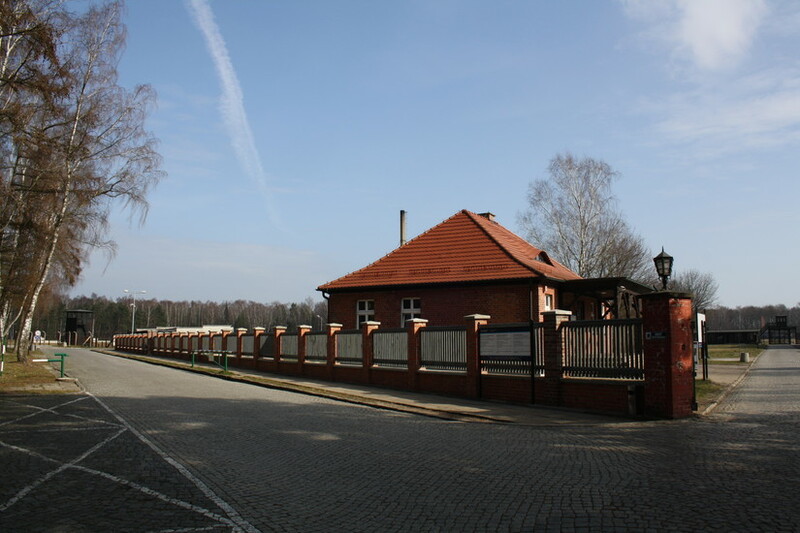 Just how fast Stutthof increased in size is illustrated next, as well as individual stories of heroism and escape; only Włodzimierz Steyer is recognised as having successfully fled, testament enough to the camps reputation as being escape proof. A huge scale model, hidden behind glass, demonstrates the size of the challenge prisoners would have faced while planning such break-outs. From here visitors cross the grass to reach the barracks that formerly housed the women’s block showing prisoner transports, striped uniforms and photographs of gaunt looking prisoners. Most poignant of all, a host of personal items are also on display. These include rings crafted illegally by prisoners, dolls and pictures drawn by children - lollipop trees et al. 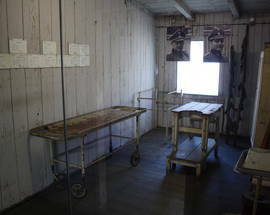 One barrack is stacked solid with original triple tier bunks, while others are home to a brutal looking operating theatre as well as a slab on which prisoners would lie before being given a fatal injection of phenol. The sight of clunky looking syringes repulses the body. As the war lengthened the killing process was streamlined, and next on your tour is a brick gas chamber used to execute anything up to a hundred prisoners at a time. 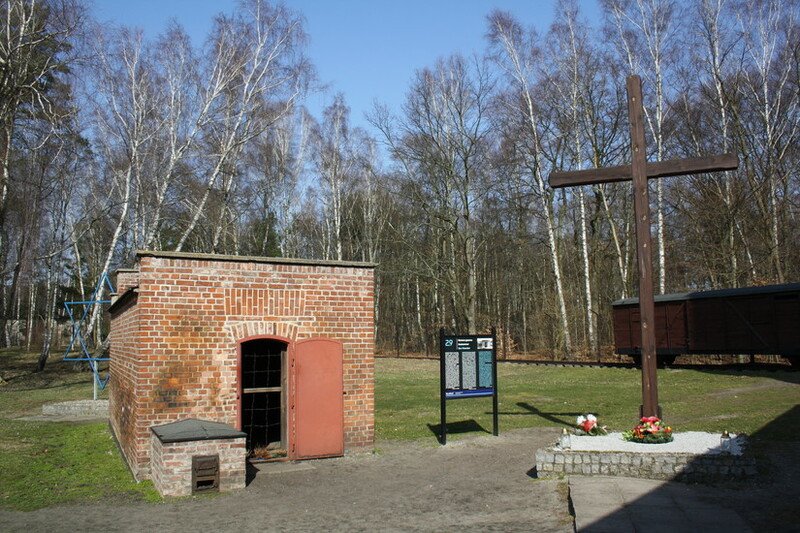 A Star of David and Catholic cross outside recognises the beliefs of those who died, while to the right is a gloomy crematorium used to burn corpses. Three original ovens have been preserved, and these are flanked by memorial notices, candles and floral tributes. Walk through further chambers outlining the Nazis’ murderous methods, as well as rooms dedicated to the death marches and the Nazi trials that followed after. An original gallows stands outside, as well as cattle trucks used to transport men and women from across occupied Europe and, as the war progressed, to act as mobile gas chambers. As you loop around to the area of the ‘new camp’ your route takes you past an epic memorial that dominates the skyline. Known as the Monument to Fight and Freedom, and designed by Wiktor Tolkin, it was unveiled on May 9, 1968, the 23rd anniversary of the camps liberation. Forming a part of this landmark obelisk is a horizontal shaped reliquary containing the human ashes and bone fragments recovered from the soil in the excavations that followed in the years after liberation. Remembrance services are held here on the first Saturday of September to mark the creation of the camp. Much of Stutthof was razed to the ground as the Nazis sought to hide traces of their crimes, and as such the area known as ‘new camp’ now has 21 concrete blocks placed in the area where the barracks once were, as well as a Star of David marking what was once the Jewish area of the camp. Walking across this wind blasted field allows plenty of opportunity for reflection, though don’t think your visit has ended. 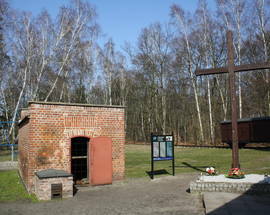 Around 500 metres into the forest to the north of the perimeter is what is referred to as ‘the Holocaust stake’. Prior to the construction of the gas chamber it’s here that thousands of Jews were herded before being executed by firing squads, their bodies then burned on funeral pyres. A ring of symbolic stones marks the edge of the pit. Admission free (contributions welcomed). Film exhibit 3zł. Guided tours 180zł. Parking 7zł. Viele vergessen, was dort passierte. Erhaltet die Erinnerungen! Vergeßt aber auch nicht die Greueltaten der Russen und Polen, die viele dieser Lager weiterbenutzten und Deutsche dort mißhandelten und umbrachten. Vergeßt auch nicht, daß dieses Land, auch mein deutsches Vaterland ist, wenn auch von Polen verwaltet. Nie wieder Krieg! Many forget what happened there. Get the Memories! But also do not Forget the Atrocities of the Russians and Poles, who continued to use many of these Camps and mistreated and killed Germans there. Also Do not Forget that this Country, also my German Fatherland, is also managed by Poland. Never again war! If I understand correctly, you are travelling on Saturday March 11. The most convenient bus departs Gdansk Main Bus Station at 10:15 and arrives at the museum at 11:23.Tickets cost 9.50zl for adults and 5.99zl for children.Here is a link (http://gryf.trasownik.net/rozklad-870_20161211-1-1.html) to the bus schedule showing departure times from Gdansk (you need the ''''Soboty - poza okresem wakacji letnich'''' as these are for Saturdays outside of holiday times) and the link to the bus times from the museum are found here (http://gryf.trasownik.net/rozklad-870_20161211-21-2.html). Gdansk- Going to the Stutthof 170,311 3 adults, 1 child 14 years, what does it cost, times the bus go? For as long as I shall live and breathe Gods given air and beauty , every breathe I take shall be in forever thought of these soul that were taken away from this precious life on earth.My father was a prisoner in this camp. Polish Air Force Paratrooper and managed to escape alongside four other Airmen. This was due to the high rate of drunkenness amongst the German guards on the gate. I have much more to tell you on this subject. A superb site .God bless you all. Speechless! How far the madness of one man can stretch!